The Bagot is believed to be Britain’s oldest breed of goat with a documented ancestry. The first recorded account of the breed appears in historical documents from 1389, when Sir John Bagot was known to be the keeper of the original herd at Blithfield, his Staffordshire estate in the English Midlands. The Bagot goat was originally managed as a feral and semi-feral parkland breed in Bagots Park, just three miles from Blithfield Hall. They proved to be extremely self-reliant, which has ensured their continued survival over many centuries. The Bagot goat is classified as an historical parkland breed and developed over six centuries as a single isolated herd. Intervention was limited to the occasional cull to manage the population, leaving most of the breed’s development to natural selection. Culls conducted during the 20th Century are believed to have been an attempt to create a more uniformly patterned herd, however these efforts proved unsuccessful and these black and white goats still exhibit diversity in their coat patterns. Today very few Bagots are managed as a semi-feral herd on an extensive range. Levens Hall in Cumbria is one of the few locations where Bagots living a ‘wild’ existence can be observed. The Bagot goat has adapted well to life as a domestic goat. Individual goats vary, but many will overcome their naturally timid nature and become tame and gentle pets. A few small Bagot herds are kept and thrive in paddock enclosures, where they are provided with forage and fresh vegetation daily. The majority are managed as grazing stock on pasture, where they remain for most of the year, usually only housed for kidding. The Bagot goat is surprisingly tolerant of rain, usually only seeking shelter in the heaviest downpour. Maintaining their hardiness and adaptation to the British climate is a priority, however in all but the most extensive range a simple shelter should be provided. In nature goats are a mountain and upland species, however the Bagot is the UK’s only primitive goat breed to have developed in the English lowlands, where it has adapted to the challenges of this environment. The Bagot goat’s attractive appearance and fascinating character, together with its long history, has helped it to find favour with its supporters, who appreciate both the value and the importance of conserving one of our rarest native breeds. Despite the absence of a recognised economic purpose, their keepers gain tremendous enjoyment from their Bagots. The exact origin of the Bagot is unknown, however there appears to be two leading theories. The first theory is that they were brought to Britain during the Crusades in the Middle Ages and were later given to Lord Bagot by the King in recognition of the good hunting that he enjoyed on the estate. The second theory is that they originated from goats already native to Britain. In Medieval times, when several breeds became emparked, colour had significant meaning to the extent that laws existed which dictated their use according to social rank. These sumptuary laws gave high rank to both pure white and black, as found in both Bagot goats and White Park cattle. We do not know for certain if this influenced the choices of livestock to adorn these old country estates, but it is certainly true that black and white animals are particularly striking within the landscape. It has also been suggested that they may share a common ancestor with the Valais Black-Necked goat of Switzerland, however any link with this similarly patterned breed has not been proved. The Valais is an improved breed kept for meat and occasionally milk. It’s appearance today differs significantly from its primitive ancestors, which were believed to have been very like the Bagot. Goats similar in colour pattern and appearance to the Bagot are often found in the landrace breeds of the Scandinavian countries today. As you can see, there are several possibilities when considering the Bagot goat’s origin, however after more than 600 years of genetic isolation, the Bagot goat is a distinct breed of great historical significance. The Bagot is a small to medium sized goat. It has large curved horns which sweep backwards with very little lateral twist. The head and forequarters are predominantly black and the hindquarters are predominantly white. Many animals have black patches on the hindquarters and a white blaze on the face. Given the importance of natural selection in the historical development of the breed, a prescriptive breed standard is inappropriate. Instead the Bagot goat has a breed description in which the diversity in phenotype found in the original herd has been accommodated. Bagot goats are not selectively bred to improve their meat and milk yields and therefore they are not believed to possess a commercial application. Instead their value is as a breed of goat that has developed through natural selection and therefore adapted to thrive on an extensive range in lowland Britain, with minimal human intervention for most of the year. (The provision of protection from predators and inclement weather at kidding time is strongly advised in both domestic and parkland situations). Current work is seeking to ascertain their value in conservation grazing and habitat management, particularly in the clearance of invasive woodland. 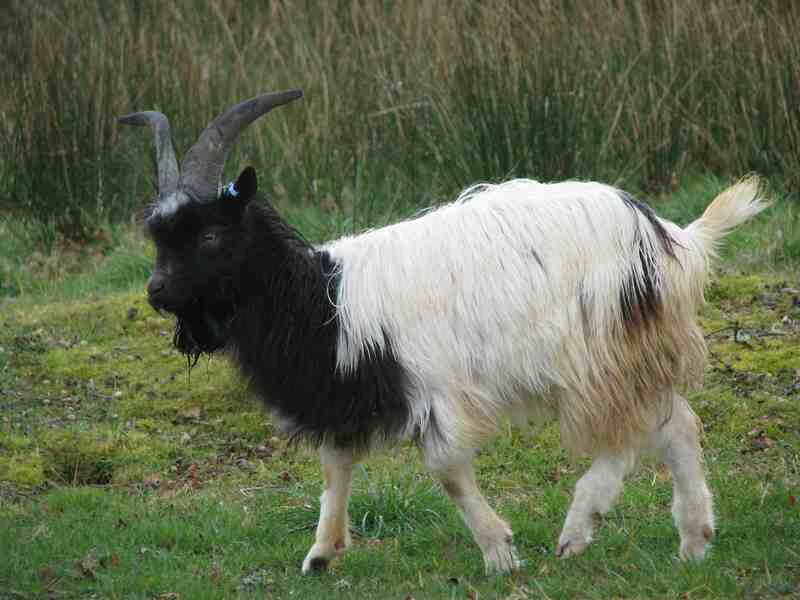 The small population of Bagot goats can make sourcing breeding stock rather a challenge. However stock is usually available each year and patience will usually be rewarded with goats with which to start a herd. We recommend that you contact the Society’s Secretary if you are looking for stock or have Bagot goats for sale.